I'm not gonna lie, this week was not good, is was damn good! pound the chicken breasts until they are 1/4 inch thick. Combine flour, salt, and pepper on a plate. On a second plate, beat eggs with 1 tablespoon water. 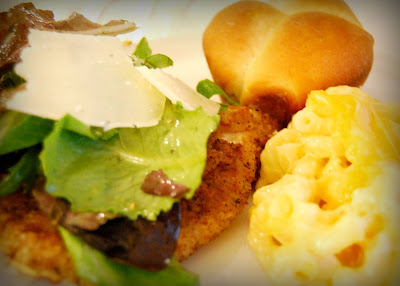 On a third plate, combine bread crumbs and parmesan. Coat chicken on both sides with flour, then dip in egg and dredge both sides in bread-crumb mixture, pressing lightly. Heat 1 tablespoon butter and 1 tablespoon olive oil in large saute pan and cook 2 or 3 minutes each side until cooked through. Add more butter and oil an dcook the rest of the chicken breasts. Toss salad greens with vinaigrette. Place a mound of salad on each hot chicken breast. Serve with extra parmesan cheese. 1 1/2 pounds elbow macaroni, cooked and drained. Preheat oven to 350 derees. Spray 4 quart casserole dish with cooking spray. In small saucepan, melt butter. Stir in flour then add milk all at once. Cook and stir until the mixture begins to simmer, then reduce heat and cook until smooth and slightly thickneed and starting to bubble. Stir in salt and pepper. Stir in 3 cups each of the cheddar and monterey jack cheeses until melted. Place macaroni in large bowl and pour cheese mixture over it. Mix well and turn into the casserole dish. Sprinkle remaining cheese over the top. Bake, uncovered, until hot and bubbly, about 30 minutes. 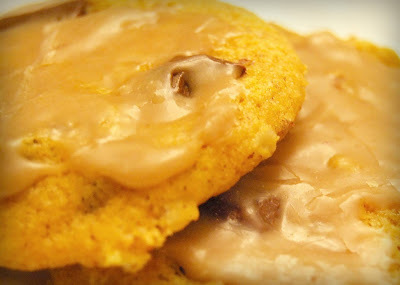 Pumpkin chocolate chunk cookies with browned butter maple frosting. there, I said it. 5 cookies. I dare you to eat less than that. Oh JANE ...THAT LOOKS SOOO YUMMY! I've decided that you need to run for "mother of the year." So, I will confess (only in the comments of your blog) we went to visit Dave's parents yesterday and they took us to dinner (I still felt awful.) It was either that or make my kids eat Dave's cooking, which no one should have to endure. But, even Famous Dave's Bar-B-Que can't compare to the meal you made for your family. I am so jealous, and suddenly very hungry. Jane, I think you ate more than 5 cookies. I'm still eating them, I'm up to 15 at least! This chicken looks awesome! I am gonna have to try it. I am such a food network junkie! I'll look forward to checking in again soon!